These women are reminiscent of the many-armed Hindu goddess, Durga– they have so many daily tasks, they could doubtless do with an extra set of hands. But they aren’t the exception. This is the reality for millions of women in India. 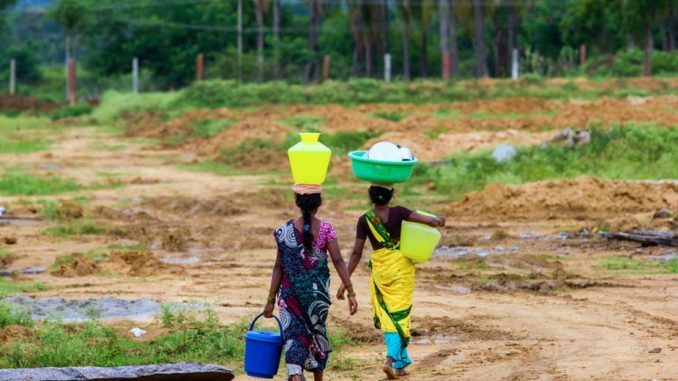 From the Western Ghats and the mountainous north-east to the arid desert state of Rajasthan, women across the country act as water collectors. And this gender specific role has a severe impact on every aspect of their lives, from their health and social life to education and their ability to have a real say in the community. However, the central government has also initiated several programmesand policies to ensure universal access to water in rural and urban areas, such as the National Rural Drinking Water Programme. Access to water is, after all, a fundamental right, covered by the “right to life” that is guaranteed by the Constitution. Indeed, Indian law far predates the international human rights regime on this. The broader human right to water was only recognised in 2002 under General Comment 15 of the UN Committee on Economic, Social and Cultural Rights (CESCR).